Keep your drill bits handy. This stand attaches to your drill press column just where you want it. Designed to hold our #4110 Drill Stand. Cut this holder from oak or other hardwood. Plan includes FULL SIZE patterns for two different size stands to accommodate all bench or floor model drill presses with column diameters from 2-1/2" to 4". Two 1/4" holes in the front hold your chuck key and a countersink. Two screw slots on the back of the Drill Stand secure it to the holder yet allow you to easily lift it off when you want to move your drills to another part of your shop. 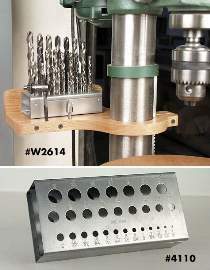 Order Drill Stand separately or save with the Special Offer which includes the #W2614 Plan and #4110 Drill Stand.